One of the most popular dances in the history of social dance, Sir Roger De Coverley (later known as the Virginia Reel), is a fun, easy group dance with long-lasting appeal. In The Perfect Art of Modern Dancing (1894), Edna Witherspoon writes: "It is one the merriest of dances, and during its performance stateliness and decorum gives place to fun and jollity, although, as a matter of course, refinement forbids anything approaching boisterous rudeness." Routledge's Ball-Room Guide (1868) describes it as "so easy, that the most inexperienced dancer may fearlessly venture to take part in it," adding, "long may its cheerful rustic strains be heard in our ball-rooms, and prove we have not grown too fine or too foolish to take pleasure in the simple dances of our ancestors." Many 19th century sources propose that Sir Roger De Coverley was (and should be) danced as the final dance of the evening. 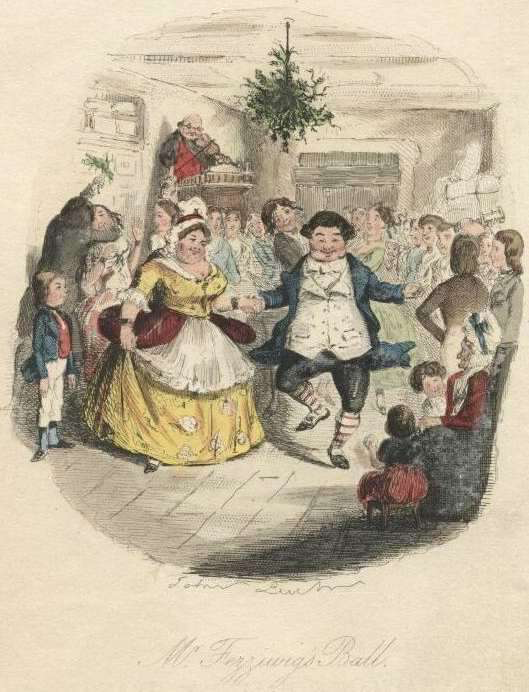 For example, in Thomas Wilson's The Complete System of English Country Dancing (c. 1820) he proposes that: "At all Balls properly regulated, this Dance should be the finishing one, as it is calculated from the sociality of its construction, to promote the good humour of the company, and causing them to separate in evincing a pleasing satisfaction with each other." Likewise, Routledge (1868) writes that "Sir Roger de Coverley is always introduced at the end of the evening; and no dance could be so well fitted to send the guests home in good humour with each other and with their hosts." Below is an ongoing attempt at a comprehensive reconstruction. As new sources are added, this description will be updated. 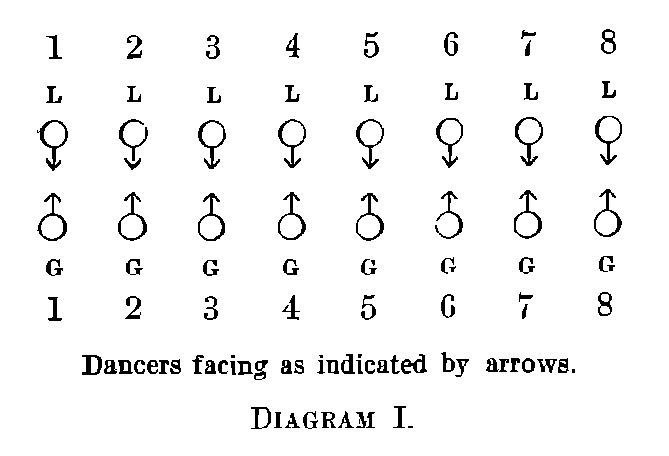 Longways sets of eight couples, a line of eight Leads facing a line of eight Follows. * The Follows are on the right side of the room (i.e., if all face the top of the hall, the Follows are on the right, as is customary). As most of the dance occurs between the lines, the lines should be far enough apart for this to happen comfortably. * Early sources, including Playford 1695 and Wilson 1820, describe the formation as "longways for as many as will," but later sources propose a set of eight couples as the optimal length. (Witherspoon 1894 writes: "It is a mistake to have too many couples in line, eight being the number most conducive to general enjoyment.") The illustrations of the figures below, from Wilson 1820, show a set of nine couples. There are many different versions of Sir Roger De Coverley, which can be explored in detail in the Historical Descriptions section below. The reconstruction presented here is an attempt to capture all of the key elements, which can be re-arranged or abbreviated to suit the fancies of each dance community. If you like all the parts, do all the parts. If you don't like something, or the complete version feels too long, include only your favorite parts, in the order that makes the most sense to you. This may sound like chaos, but as the historical descriptions below clearly show, this is exactly what dance masters have been doing with this flexible and popular dance for centuries. * Bland 1868 and Routledge 1868 describe an additional figure for the whole set that precedes this one, but it's rare: all advance and retreat, cross to opposite places, and repeat to regain original places. The second couple, i.e., the first Lead (at A) and last Follow (at B), advance to C and interact with each other in the same way as the first couple, then retreat to home places. Then the first Follow and last Lead interact in another way, followed by the second couple interacting in that way. * This isn't to suggest that each head couple chooses what they want to do and the last couple follows in a call and response fashion (though that could be a fun 21st century adaptation of the dance, especially if the couples were encouraged to invent new ways to interact). The order of interactions is set beforehand, and every pair of couples in the hall does them in the same way and at the same time. * This is a list of all of the popular possibilities described in the sources below. Many descriptions of the dance omit one or more of these figures, noting that the dance can get tedious otherwise. Routledge 1868, for example, includes only the first two. The order listed is the most popular order of the interactions, but not the only one. Dodworth 1873 and Witherspoon 1894 describe an additional advance and retreat (without honors), but it's rare and redundant. * If the set is long, several sources suggest that the head couple may pass behind two people as they weave outside the set, rather than passing behind every person individually (i.e., crossing at C, E, G, etc.). Alternatively, many sources suggest that this figure is frequently omitted, as it can make the dance tedious. If this figure is omitted, the next figure omits the promenade and starts immediately with the cast off. * Where the weave is omitted, Routledge 1868 suggests that the cast off may be begun with the head couple advancing and honoring each other before casting off. Desrat 1875 proposes that the head couple dos-à-dos and honor. Showing just how many totally different versions of this dance there are, J. Daniel & Sons 1879 proceeds from the first part to the cast off (without an arch, so the heads end up back at home), and ends with the head couple weaving through everyone to end up at the bottom. 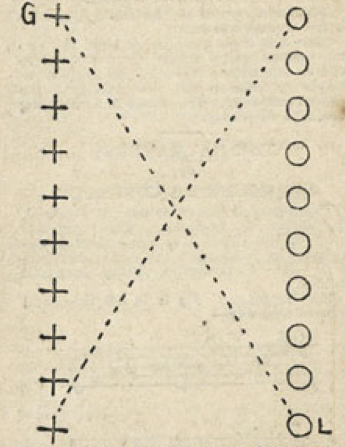 * Wilson 1820 says that all couples follow the heads "beginning from the bottom," and omits the arch, suggesting that the second to last couple starts following the heads during the promenade up the middle, and the whole lines travel from E to A to D to E (and F to B to D to F) in a serpentine fashion. Though the figure is quite different, the ultimate re-arrangement of the couples is the same. Witherspoon 1894 provides yet another ending: after the cast off, the couples meet at the bottom and all chassé up the center to the top. When the head couple reaches the top, the rest of the set forms an arch (or arbor), and the head couple chassés back down to the bottom. Dodworth 1873 proposes the same path, specifying the chassé, but not the arch. Newman 1903 specifies the same path, with the arch, but not the chassé. Wilson 1899 proposes the same path, specifying neither the chassé or arch. * Newman 1903 adds an additional honors of forward and back, forward and bow, to the end. Wilson, The Treasures of Terpsichore, 1816: Wilson suggests that the Playford tune of the same name from 1695 (see below) may be used for this dance as well, even though this dance is unrelated to the original Playford dance. Wilson, 1820: It "has a tune bearing its name composed expressly for it in 9/8, which is given to enable the Dance to be performed more Correctly." 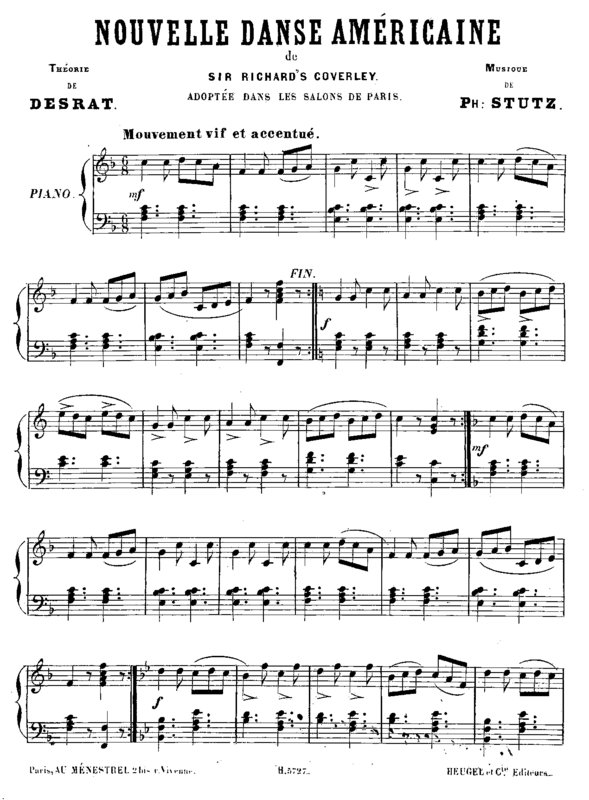 Desrat, 1875: Full sheet music is provided (see below) in 6/8 time with "mouvement vif et accentué." Skinner, 1898: "The Haymakers' Jig is in 6-8 time" Four bars of the Haymakers' Jig can be viewed below, and you can hear those bars here. Wilson, 1899: "For the music, any hornpipe or reel may be used, the only requirements being that it shall be lively, in double time, and having a marked rhythm." In summary, for the early 19th century (i.e., a Regency Sir Roger), use a slip-jig (in 9/8). Susan de Guardiola recommends "Sir Roger de Coverley" (sample) a medley of 1816 tunes played by Spare Parts. For the late 19th century (i.e., a Victorian Sir Roger), almost anything goes: a jig (6/8), a reel (4/4), a hornpipe (4/4) are all attested to as authentic. 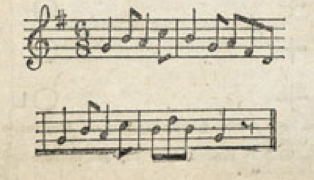 In A Companion to the Ball Room (1816), Wilson states that "Tunes in 9/8 always require Irish Steps, whatever may be their origin," but he doesn't specify what these Irish Steps are. In reference to this issue, Susan de Guardiola (2008) proposes that a skipping step, or step-hop, may be used, but notes that at the end of a tiring evening, this often devolves into simple walking. She continues, "One critical element, often ignored, is that the music is in compound triple (9/8) time and thus breaks down in threes rather than twos. This means that figures should be performed with six or twelve steps, e.g. six steps forward and six steps back for each diagonal to advance and retire." Witherspoon, 1894: "The step used in the Virginia reel is an easy, swinging trot, and exact time should be kept with the music." In the first part, "The first gentleman and last lady take four steps toward each other between the lines, and then four steps back to place." Wilson, 1899: "There are no pauses in this dance, and the step throughout is suggested by the music—an energetic swinging trot in exact time to the music." In 9/8 time, use six steps forward and back. In 6/8 or 4/4 time, use four steps forward and back. In any case, keep it as sprightly as you can that late in the night. The 1. man go below the 2. wo. then round her, and so below the 2. man into his own place; then 1. wo. go below the 2. man, then round him, and so below the 2. wo. into her own place: The 1. cu. cross over below the 2. cu. and take hands and turn round twice, then lead up through and cast off into the 2. cu place. This Dance was composed expressly for a finishing Country Dance, about 100 years ago, and derived its name from Addison's Sir Roger De Coverley; so frequently mentioned by him in his popular Essays in the Spectator, and is the only whole Dance given in this System. The Figures of which it is composed being permanent and unalterable, and thereby differing in its construction from all other Country Dances. It is Capable of being performed by a whole set, however numerous; the top Lady and bottom Gentleman commencing the Dance by meeting in the centre, (see Diagrams) and has a tune bearing its name composed expressly for it in 9/8, which is given to enable the Dance to be performed more Correctly. It is necessary, that the persons who are to perform this Dance, should place themselves very widely apart, and exactly opposite to each other, that the top Lady and bottom Gentleman may have sufficient space in which to perform the different Figures in the centre, and that the performers may with proper ease promenade and cross over, &c. and where the set is very numerous, it is allowed to the couple going down, to miss every alternate couple, so as to cross over two couple instead of one, and it must be observed, that in crossing over the Lady must pass in front of or before the Gentleman. At all Balls properly regulated, this Dance should be the finishing one, as it is calculated from the sociality of its construction, to promote the good humour of the company, and causing them to separate in evincing a pleasing satisfaction with each other. The top Lady at A and the bottom Gentleman at B advance and meet at C, and retreat to their places, the Lady to A and the Gentleman to B. The bottom Lady at B and the top Gentleman at A, meet at C and retreat to their places; the top Lady and bottom Gentleman then advance to the same situation and turn with their right hands; the bottom Lady and top Gentleman do the same; the top Lady and bottom Gentleman then meet and turn with their left hands, the bottom Lady and top Gentleman do the same; the top Lady and bottom Gentleman then meet and turn with both hands; the bottom Lady and top Gentleman do the same; they then meet and allemande round each other, the bottom Lady and top Gentleman do the same. The top couple at A B pass each other at C and cross over every couple till they get to the bottom, they pass each other at D E F G H I J.
N.B. Should the set be very long, they may cross over every other couple, missing a couple each time. They now promenade up the centre from E F to A B, then cast off the Lady in the line C, and Gentleman in the line D, all the couples following them, beginning from the bottom, by which means they all regain their situations, except the couple which began the dance, who will be now at the bottom of the room. N.B. This dance may be performed by any number of persons. It was not intended in this work to give any whole dances, but as this is so different in its movements from any other, the author thought proper to insert the whole of it. But if they had been twice as many-ah, four times-old Fezziwig would have been a match for them, and so would Mrs. Fezziwig. As to her, she was worthy to be his partner in every sense of the term. If that's not high praise, tell me higher, and I'll use it. A positive light appeared to issue from Fezziwig's calves. They shone in every part of the dance like moons. You couldn't have predicted, at any given time, what would have become of them next. And when old Fezziwig and Mrs. Fezziwig had gone all through the dance; advance and retire, both hands to your partner, bow and curtsey, corkscrew, thread-the-needle, and back again to your place; Fezziwig "cut"-cut so deftly, that he appeared to wink with his legs, and came upon his feet again without a stagger. When the clock struck eleven, this domestic ball broke up. Mr. and Mrs. Fezziwig took their stations, one on either side of the door, and shaking hands with every person individually as he or she went out, wished him or her a Merry Christmas. When everybody had retired but the two 'prentices, they did the same to them; and thus the cheerful voices died away, and the lads were left to their beds; which were under a counter in the back-shop. The couples stand in two lines, wide apart, as in country dances. The first Lady and last Gentleman advance to centre, bow and courtesy, and return to places; the last lady and first Gentleman repeat the same; top couple pass down the centre or outside the set, meeting at bottom; promenade up the centre, all the couples following to the top in rotation; separate, the Gentlemen to the left and the Ladies to the right returning to places, except the first couple who remain at the bottom. Recommence the figure by the top Lady and bottom Gentleman leading off the same figures as before, which are repeated throughout the whole set. But Solomon was already impatient to prelude again, and presently broke with much spirit into "Sir Roger de Coverley", at which there was a sound of chairs pushed back, and laughing voices. "Aye, aye, Solomon, we know what that means," said the Squire, rising. "It's time to begin the dance, eh? Lead the way, then, and we'll all follow you." Form in two lines: ladies on the left from the top. All advance (2 bars); retire (2 bars); cross over (4 bars); re-advance (2 bars); retire (2 bars); recross over (4 bars). Top lady and bottom gentleman advance to each other, bow and courtsey. Top gentleman and bottom lady do the same. Top lady advances with bottom gentleman, and present right hands, and pass quickly round each other to their own places. Bottom lady and top gentleman do so likewise. [The top lady gives her right hand to her partner, and passes behind the next two gentlemen. She then crosses the line, giving her left hand to her partner, and then passes behind the next two ladies; and this order is kept up all the way to the bottom of the line. The top gentleman performs the same figure, and at the same time. This figure contained within the brackets is generally omitted. The top couple make a conge and cast off, ladies to the right and gentlemen to the left, all following the top couple, who remain at the bottom of the line, and let all the other couples pass under their arms (or not, ad libitum), until all arrive at their own places except the top couple, who remain at the bottom. The figure is repeated until all the couples have gained their places. We conclude our account of the dances now most in vogue with an old-fashioned favourite, whose popularity dates from a bygone age, and bids fair to survive the present one. Long may its cheerful rustic strains be heard in our ball-rooms, and prove we have not grown too fine or too foolish to take pleasure in the simple dances of our ancestors. Sir Roger de Coverley is always introduced at the end of the evening; and no dance could be so well fitted to send the guests home in good humour with each other and with their hosts. We describe it as it is danced in the present day, slightly modernised to suit the taste of our time. Like the quadrille, it can be danced with equal propriety by old or young ; and is so easy, that the most inexperienced dancer may fearlessly venture to take part in it. Form in two parallel lines; ladies on the left, gentlemen on the right, facing their partners. All advance; retreat (which occupies the first four bars); cross to opposite places (four bars more); advance and retreat (four bars); re-cross to places (four bars). The lady who stands at the top, and the gentleman who stands at the bottom, of each line, advance towards each other, courtesy and bow, and retire to places. The gentleman at the top and the lady at the bottom do the same. Lady at top and gentleman at bottom advance again, give right hands, and swing quickly round each other back to places. Gentleman at top and lady at bottom do the same. Top lady advances, gives right hand to partner opposite, and passes behind the two gentlemen standing next to him. Then through the line and across it, giving left hand to partner, who meets her half way between the two lines, having in the meantime passed behind the two ladies who stood next his partner. Lady then passes behind the two ladies next lowest; gentleman at same time behind the two gentlemen next lowest; and so on all down the line. At the bottom, lady gives left hand to her partner, and they promenade back to places at the top of the line. (This figure is frequently omitted.) Top couple advance, courtesy and bow, then lady turns off to the right, gentleman to the left, each followed by the rest of her or his line. Top couple meet at the bottom of figure, join hands, and raising their arms, let all the other couples pass under them towards the top of the line, till all reach their own places, except the top, who have now become the bottom couple. Figure is repeated from the beginning, until the top couple have once more worked their way back to their original places at the top of the line. Danced with eight couples, in two lines, the ladies on one side and the gentlemen on the other, facing inward. Forward and back: forward and turn with the right hand; turn with the left hand; turn with both hands; forward and dos-a-dos; forward and back. First lady then turns with the left hand every gentleman down the line, while her partner turns every lady; between each one turn partner with right hand; when arrived at the bottom, return to the head; separate from partner, lady passing down the outside of ladies' line, and gentleman passing down the outside of the gentlemen; all follow, meeting partners at the bottom, and then chassez up the centre, when first couple chassez down the middle, and takes position below the last couple, when the figure commences with the new couple at the head. The Gentlemen and the ladies, whatever their number may be, place themselves respectively on two parallel rows each gentleman being opposite his partner, the first gentleman and last lady and the last gentleman and first lady go through the figures described below alternately. Firstly — Chain by the right hand, secondly chain by the left hand. Thirdly chain by both hands. The gentleman and his partner then dance back to back bow to each other and resume their places. The first gentleman then turns round to the left and proceeds to the other end of the room, followed by all the other gentlemen, while his partner turns to the right and is followed by all the other ladies. The two first partners thus find themselves opposite each other at the other end of the room, where they join hands and hold them up in the shape of an arch beneath which all the gentlemen and ladies pass in succession. The last gentleman and last lady [sic - this would be the second gentleman and lady] the find themselves the first on the row and go through the figures executed by the first couple. And so on until each couple has gone through the whole. N. B. In England, the jig is concluded by a lady's chain, but the length of the dance in that case renders it monotonous and for this reason, the finale has been suppressed in France. Top lady and the bottom gentleman advance to the centre of dance, turn with both hands and back to places; the first gentleman and bottom lady do the same; the top lady and bottom gentleman again advance, turn with right hand and back to places; then the top lady and bottom gentleman advance and turn with left hand and back to places; the top gentleman and bottom lady do the same. The top lady and bottom gentleman bows and lady curtsies; the top gentleman and bottom lady do the same. The top lady and bottom gentleman advance and pass back to back; top gentleman and bottom lady do the same. The top couple turn, the lady to the right and gentleman to the left; all the ladies following the gentleman to the bottom of the room, where they meet their partners and head up the centre of the room. The top couple half pousette with each couple till they reach the bottom of the dance. This is known in England as the "Sir Roger de Coverly." It is one the merriest of dances, and during its performance stateliness and decorum gives place to fun and jollity, although, as a matter of course, refinement forbids anything approaching boisterous rudeness. The difference between those who have not been accustomed to refining influences is at no time so strongly marked as when they are in their merriest moods. It is to be regretted that the dancing of to-day is not characterized by the gallantry and courtesy on the part of the men and the refined and graceful movements on the part of the women which were so common in the days of our grandfathers. After beholding a company of apparently refined young people run, push and scramble through a dance; allowing individual habits of motion and manner to be most noticeable, one is forced to admit that the art of dancing has deteriorated since the days of knee-breeches and powdered wigs. The Virginia reel is danced by eight or more couples. The dancers form two lines down the middle of the room, the gentlemen on one side and the ladies on the other, and partners facing one another, as in diagram I. The lines should not be too close together, as nearly all the dancing is done between them: and crowding is to be avoided. The couples may be designated as first, second, third, and so on to the last couple; and the top and bottom couples are obviously those at the head and foot of the column. Every couple in turn becomes top or bottom at least once during the dance. First Gentleman and Last Lady Forward and Back, 4 bars. First Lady and Last Gentleman Forward and Back, 4 bars. First Gentleman and Last Lady Forward and Turn with Right Hands, 4 bars. First Lady and Last Gentleman Forward and Turn with Right Hands, 4 bars. First Gentleman and Last Lady Forward and Turn with Left Hands, 4 bars. First Lady and Last Gentleman Forward and Turn with Left Hands, 4 bars. First Gentleman and Last Lady Forward and Turn with Both Hands, 4 bars. First Lady and Last Gentleman Forward and Turn with Both Hands, 4 bars. First Gentleman and Last Lady Forward and Dos-a-dos, 4 bars. First Lady and Last Gentleman Forward and Dos-a-dos, 4 bars. First Gentleman and Last Lady Forward and Salute, 4 bars. First Lady and Last Gentlemen Forward and Salute, 4 bars. Turn with Right Hands, 2 bars. Separate and Turn Second Couple with Left Hands, 2 bars. Partners Turn with Right Hands, 2 bars. Separate and Turn Third Couple with Left Hands, 2 bars. The first couple turns thus in alternation until the bottom is reached, when they join hands and return to their places at the top. The gentlemen then march to the left and the ladies to the fight, and the head couple pass down the middle to the bottom. The step used in the Virginia reel is an easy, swinging trot, and exact time should be kept with the music. The top and bottom couples dance together, the lady of the top couple dancing with the gentleman of the bottom couple, and vice versa. First Gentleman and Last Lady Forward and Back .-The first gentleman and last lady take four steps toward each other between the lines, and then four steps back to place. The first lady and last gentleman do the same. First Gentleman and Last Lady Forward and Turn With Right, Hands .-the lady and gentleman dance to meet each other between the lines, join right hands, turn half round, separate, and return to places. Their partners execute the same movements. The first gentleman and last lady then turn with left hands, and their partners do the same. Lastly, the first gentleman and last lady turn with both hands, and are followed by their partners in the same movement. First Gentleman and Last Lady Forward and Dos-a-Dos .-The two dancers advance to meet each ether, pass round each other, back to back, from left to right, and return to places. Their partners do the same. First Gentleman and Last Lady Forward and Salute .-This movement is very simple. The first-gentleman and last lady dance to the middle of the column, where the gentleman bows, while the lady makes a deep courtesy. Their partners then execute the same movement. The next movement appears the most difficult in the dance, although really very simple. The first couple forward and turn each other with right hands; the lady then turns the second gentleman with her left hand, while her partner turns the second lady in the same way; next the first couple turn each other with right hands and then turn the third couple as just described for the second; and so the movement continues until the lady has turned every gentleman in the line, and the gentleman every lady. On reaching the bottom of the line, the first couple join hands and return to the head. Here they separate, the lady marching down the outside of the ladies' line, the gentleman marching down the outside of the gentleman's line, and all the other dancers following their respective leaders. As partners meet at the bottom they chasse up the center; and when the first couple arrives at the top the other couples separate and with raised hands form an archway, under which the first couple pass to the bottom, where they take positions in their respective lines, the other couples at the same time disengaging hands and separating into the two original lines. The dance then begins again, the second couple being now at the head and the first couple at the bottom. Dancing all the movements as many times as there are couples brings the first couple back to the head of the column; and the dance may then end or be repeated as often as desired. It is a mistake to have too many couples in line, eight being the number most conducive to general enjoyment. The former is the name used in Scotland, the latter in England. The recognized place of this dance is at the end of a programme to finish up a ball with; but it is little danced nowadays, being long and tedious. 1. Top lady and bottom gentleman advance to the centre (along the lines shown), and turn round, giving right hand, and retire to places. 2. This is repeated by top gentleman and bottom lady. 3. Top lady and bottom gentleman advance as before, but turn with left hands. 4. Top gentleman and bottom lady repeat. 5. The first two repeat their movement, but turn with both hands. 6. This is repeated by the second two. 7. First two advance and turn back to back, neatly. 8. Second two repeat this. 9. First two advance and bow (or bow and curtsey). 11. Ladies cast off to right, gentlemen to left, meeting at bottom. 12. Leading couple, now at bottom, hold up hands joined together, and allow all the other couples to pass through, leaving themselves at bottom. This is continued to the end. Any reel, such as the Fairy Dance, will do for the cast-off, or have a change of tune and tempo. The above dance of late years has undergone many alterations, and is frequently varied. Like all country dances, it is danced with gentlemen in one line, ladies opposite their partners. Gentlemen stand on the left: Ladies on the right. Fig. 1: Top lady and end gentleman (1st couple) advance, and turn once round by the right hand and back to places. Top gentleman and end lady (2nd couple), ditto. Fig. 2: 1st couple advance again, and turn by the left hand. 2nd couple, ditto. Fig. 3: 1st couple turn with both hands. 2nd couple, ditto. Fig. 4: 1st couple pass round each other back to back. 2nd couple, ditto. Fig. 5: 1st couple advance, bow, and retire. Fig. 6: Top couple lead off in the last figure of the Lancers, ladies to right, gentlemen to left. When top couple meet at end of set, they take hands and form an arch, while all the other couples lead through, keeping in their proper places all the time; the top couple are now at the bottom of the line. These figures are repeated until all the dancers have had their turn. NOTE: The following figure is nearly always introduced, but it really belongs to the Norwegian country dance: After figure 5, instead of leading off, the top couple run to the end of the set, and link right arm, turn once round, lady turns end gentleman once round, left arm linked, while her partner turns end lady in same manner; the top couple meet, link right arm, turn once round, and turn the next couple, and so on until arrived at top of set, when commence Figure 6. This is the most popular of the Contra-Dances, and no informal programme is considered complete without it. Any number of couples may participate, but where the number of dancers is very large it is better to form several sets of six or eight couples each than one large set. Two parallel lines are formed, one of gentlemen and one of ladies. These two lines stand facing, each gentlemen opposite his partner. The space between the line should be about four feet wide. The lady and gentleman occupying the ends of the lines towards the head of the room are called the top of First Couple; the lady and gentleman at the opposite ends, the bottom or Last Couple. For the music, any hornpipe or reel may be used, the only requirements being that it shall be lively, in double time, and having a marked rhythm. The two take four steps directly towards each other and four steps backward to place. The two step forward to the centre, join right hands, swing once round, and step backward to place. Exactly like preceding movement, only joining left hands instead of right. The two advance to the middle of the set, pass each other on the right, move around each other back to back, without turning, and step backwards to place. And so on to the end of the set, the first lady turning each of the gentlemen and the first gentleman turning each of the ladies, with the left hand. 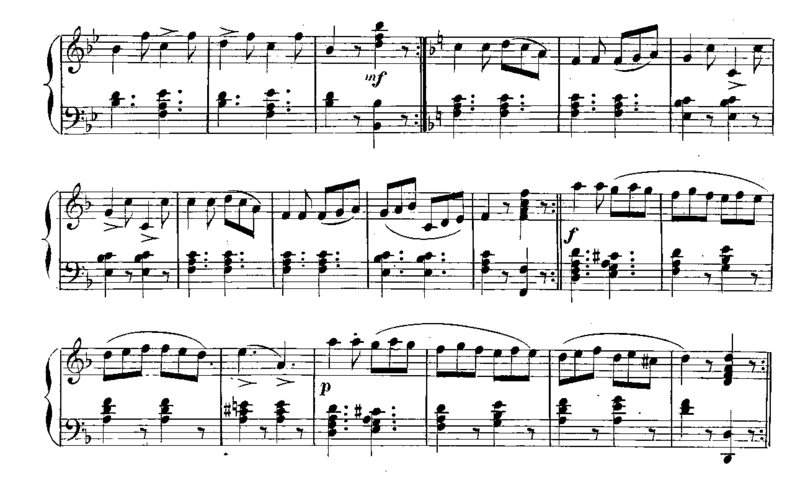 The amount of music required for this part of the dance depends upon the number dancing in the set. When the First Couple have reached the bottom of the set, they join hands and dance back to original places. All then face towards the head of the room and following the leaders, gentlemen turning to the left and ladies to the right, march down the outside and up the middle of the set. This brings all to original positions. The First Couple then join hands and dance down the middle to the bottom of the set, where they remain, leaving the Second Couple at the head. The dance is repeated as often as desired, generally until each couple, in turn, has occupied the position of Head Couple. Sometime, in the march, when the First Couple, having marched down the outside, meet at the bottom of the set, they stop, join hands and raise their arms, allowing all the other couples to pass under. This leaves them at the bottom of the lines. There are no pauses in this dance, and the step throughout is suggested by the music—an energetic swinging trot in exact time to the music. Any number of persons can engage in this dance, but there should not be more than six or eight couples in each set. The formation is in two lines, gentlemen in one and the ladies in the other, opposite and facing partners, the lines to be about six feet apart, as most of the dancing is done between the lines. The lady at the head and the gentleman at the foot of the column lead each figures, which is immediately repeated by their partners. Each figure complete, with the exception of the last, takes 8 B's. First Figure - First lady and last gentleman forward toward each other and back. Second Figure - First lady and last gentleman forward and turn each other with right hands joined, then back to places. Third Figure - First lady and last gentleman forward and turn with left hands, then to places. Fourth Figure - First lady and last gentleman turn with both hands, and back to places. Fifth Figure - First lady and last gentleman forward and walk around each other dos-à-dos (back to back), return to places. Sixth Figure - First couple turn with right hands, 2 B's; the lady then turns the second gentleman with left hand, while her partner turns second lady in the same way, 2 B's. First couple turn again with right hands, and turn the third couple as described for the second couple, and so the movement continues with each couple. On reaching the bottom of lines, first couple join hands and return to places. Then ladies turn to right and gentlemen left, march along the outside of lines, meet partners at the bottom, join hands, and return to places. When first couple arrives at the top, the other couples separate and with raised hands form an archway, under which the first couple passes to the bottom, where they take positions in their respective lines. Other couples at the same time disengage hands and resume original positions. The dance is repeated with the second couple as the lead, and so on as many times as there are couples, which would bring the first couple back to the head of the columns. Then all forward, back, forward, and bow.